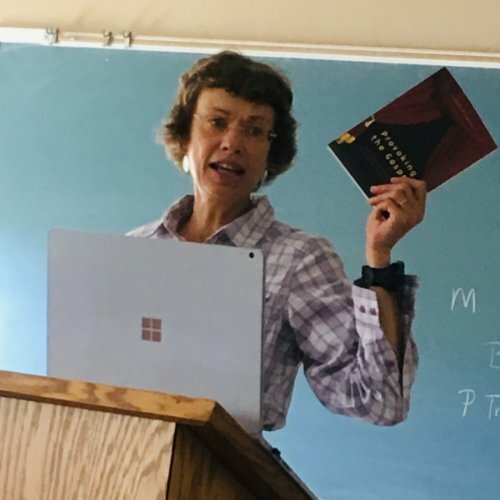 Course Description: “Biblical Storytelling” This week-long, intensive summer course comprises in-depth hearing, probing, and telling of the Bible’s stories in the Bible’s own words. Most of the Bible is story, and its overall shape is that of a story. Not only that; its writers expected that their work would be told aloud, not read silently. How can we better hear the biblical storytellers, catch their tones of voice, interpret their winks and nudges? How does the experience of Bible change when we hear and tell it live, rather than scrutinizing it on a page? The course will explore these questions and more. The retreat includes daily worship, morning and afternoon classes, nightly accommodations and all meals, opportunities for fellowship and solitude. Marti Steussy is MacAllister-Petticrew Professor of Biblical Interpretation, emerita, at Christian Theological Seminary in Indianapolis, where she continues to teach on a part-time basis. Her primary expertise is in Hebrew Bible, but she also teaches in the areas of spirituality, theology, and religion and science. She is an ordained Disciples minister and maintains an active speaking and teaching schedule in congregations and larger church gatherings, Disciple and otherwise. From childhood she has been fascinated by storytelling, and she is particularly interested in the dynamics of biblical narrative. She has been keynote speaker at Network of Biblical Storytellers festivals in the US and Canada, offers regular workshops at the Network’s national gathering, serves on its Board, and is a founding member of and regular program planner for the Network’s Seminar. In addition to her professional work, she has published two science fiction novels, hiked the Camino de Santiago and parts of Japan’s Kumano Kodo pilgrimage trail, and enjoys baking bread and splitting wood.